The adulation of the crowd. The feel of the beat pulsing through your fingers as you jam to a variety of classic rock songs. Feel what it is like to be in a real rock band with Rock Band for the Nintendo Wii. While the game disc itself provides the basics, it is the variety of accessories for Wii Rock Band that make the experience complete. The Wii guitar accessory puts you right up there on stage, strumming out the notes and rhythms just like the professionals. Simple to learn, yet addictive to play, the Wii guitar features five colored frets that match the notes as they come down your television screen. Cool effects are also part of the guitar accessory, which allow you to add things like wah-wah and echo effects. The Wii guitar is wireless, and a USB hub is included for various components. The Wii drum accessory allows you to lay down the beats of all your favorite rock songs, while also serving as a Wii controller. Building upon the Wii Guitar Hero experience, the drum accessory adds another dimension of playability to Rock Band. The drum accessory comes with a stand, four pads, a kick pedal and real drumsticks. 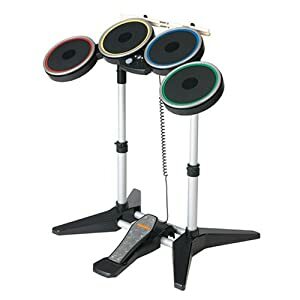 Additional Wii accessories for the drums are available, such as Rock Band drum silencers, for those late night jam sessions. The Wii microphone accessory will give you the chance to show off your pipes, as you attempt to match the singing of some of rock’s greatest frontmen. Besides picking up your voice and serving as an actual microphone, it can also be tapped against your hand to play additional percussion instruments. Have two people sing into it in unison, or add additional microphones when playing Nintendo Wii Beatles Rock Band to achieve multiple-part harmony. Nintendo Wii accessories allow you to customize your Rock Band experience to suit your personal tastes. Buy additional track pack discs to expand your music library. Get cool glow-in-the-dark drumsticks for added effect. Add a double cymbal expansion kit to fill out your Wii drum accessory. Get a microphone stand so you can play the Wii guitar and sing at the same time. The possibilities and combinations are only limited by your imagination and your desire to experience Rock Band for Nintendo Wii.